Combine dates, walnuts, 6 Tbsp. cacao powder, 1 1/2 tsp. vanilla, 2 tsp. water and salt in a food processor. Process until completely smooth. Lightly grease an 8-inch square baking dish, or line dish with parchment or waxed paper. Transfer dough to dish. Press dough very firmly into dish with your hands until dough is evenly distributed. In a medium mixing bowl, combine remaining 1/4 cup cacao powder, remaining 1/2 tsp. vanilla, maple syrup and oil. Stir until mixture forms a paste (this is the frosting). Spread paste evenly over dough in baking dish. 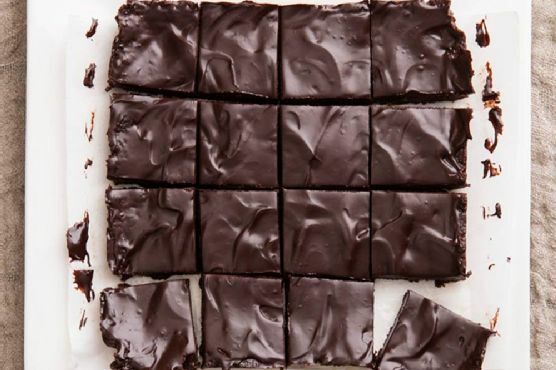 Refrigerate brownies for at least 2 hours to set, then cut into squares. Refrigerate any leftovers in a covered container for up to 2 weeks, or freeze for up to 2 months. Cream Sherry, Moscato d'Asti, and Port are my top picks for Brownies. A common wine pairing rule is to make sure your wine is sweeter than your food. Delicate desserts go well with Moscato d'Asti, nutty desserts with cream sherry, and caramel or chocolate desserts pair well with port.